Live-edged slabs are extremely popular for producing tables, islands, shelves, benches, and even tops for dressers. 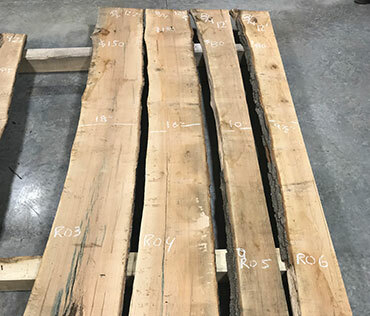 We produce kiln-dried slabs in walnut, cherry, hard maple, ash, hickory, oak, and some other species, when available, that are from 1.25 to 2.25 inches thick, 8" to 24" wide at the narrowest spot, and 4 to 12 feet long. 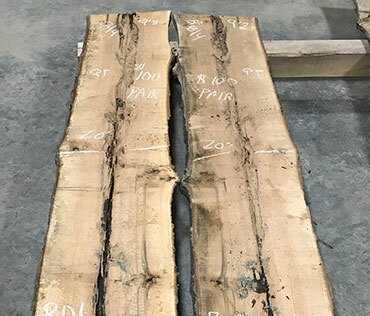 These slabs are usually "rustic" in appearance, meaning they contain some knots and crotch figure and a few will have voids that can be filled. 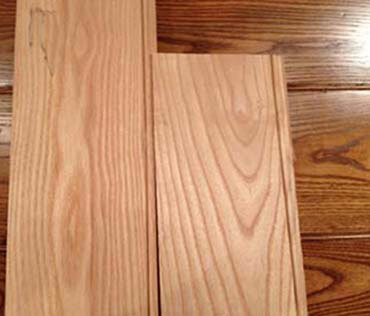 Prices range from $3.00 to $10.00 per board foot. 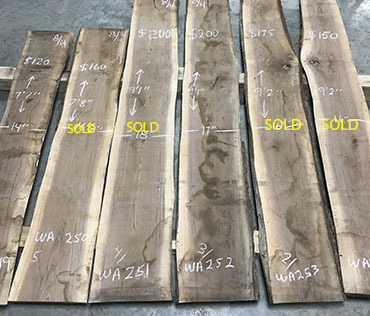 Thus, a 2-inch thick walnut slab that is 16-inches wide and 8-feet long, priced at $10.00 per board foot, would cost about $200.00, plus tax. 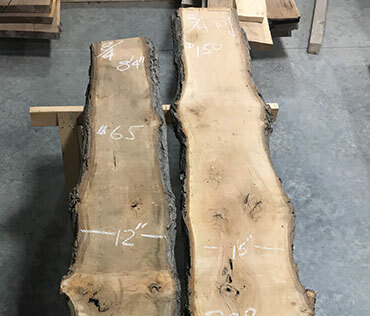 A similar ash, oak, or maple slab would cost about $65.00, plus tax. We do not ship. Following are photos of some of the slabs currently for sale. Most of the slabs have the size and price written on them. We try to keep an entire log together so book and end matching is possible when making larger table or counter tops. You do not need to buy the entire log, just the pieces you want. We do have other slabs available, as well. Six 8/4 walnut slabs, 15 1/2" to 19" wide and 12' long. Seven 8/4 walnut slabs, 16" to 20 1/2" wide and 12'6" long. Two 8/4 walnut slabs, 16" to 17" wide and 12'1" to 12'5" long. Six 8/4 walnut slabs, 14" to 22" wide and 12'6" long. Four 8/4 walnut slabs, 19" to 21" wide and 12'6" long. Four 8/4 walnut slabs, 15" to 18 1/2" wide and 12'5" long. Four 8/4 walnut slabs, 17" to 20" wide and 12'6" long. Five 8/4 walnut slabs, 13" to 16" wide and 8'7" long. 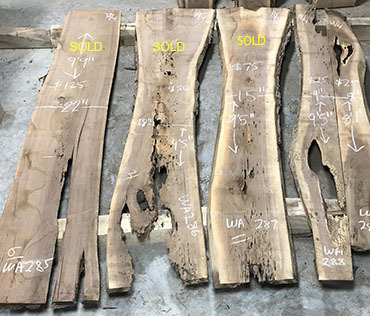 Six 8/4 walnut slabs, 14" to 18" wide and 7'7" to 9'2" long. 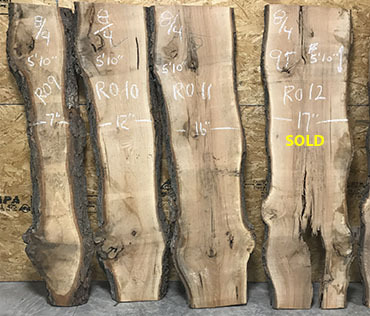 Seven 8/4 walnut slabs, 11" to 17" wide and 8'5" long. Six 8/4 walnut slabs, 15" to 18" wide and 8'3" long. Five 8/4 walnut slabs, 17" to 20" wide and 10'8" long. 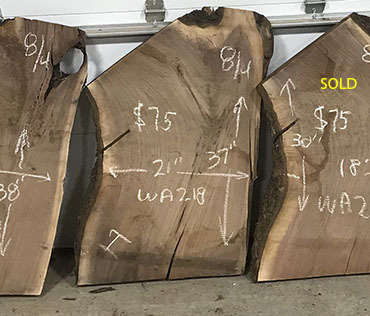 Four 8/4 walnut slabs, 20" to 22" wide and 10'2" to 10'3" long. 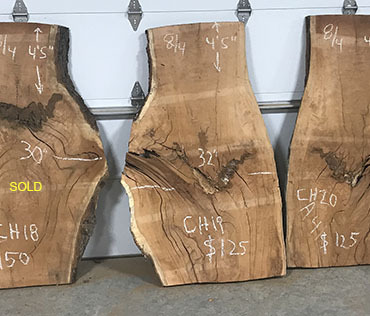 Four 8/4 walnut slabs, 15" to 22" wide and 9'5" to 9'9" long. Six 8/4 walnut slabs, 9 1/2" to 14" wide and 10'1" long. 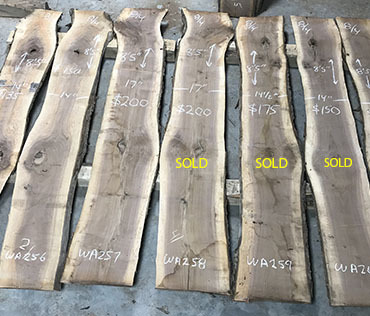 Six 6/4 walnut slabs, 13" to 16" wide at narrow part and 3'4" long. 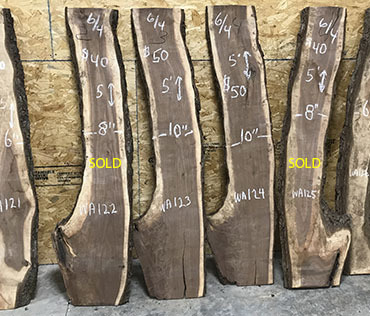 Four 8/4 and two 6/4 walnut slabs, 9" to 15" wide and 6'5" long. Four 8/4 and one 6/4 walnut slabs, 12" to 13" wide and 6'9" long. Five 8/4 and one 6/4 walnut slabs, 15" to 21" wide and 30" to 38" long. 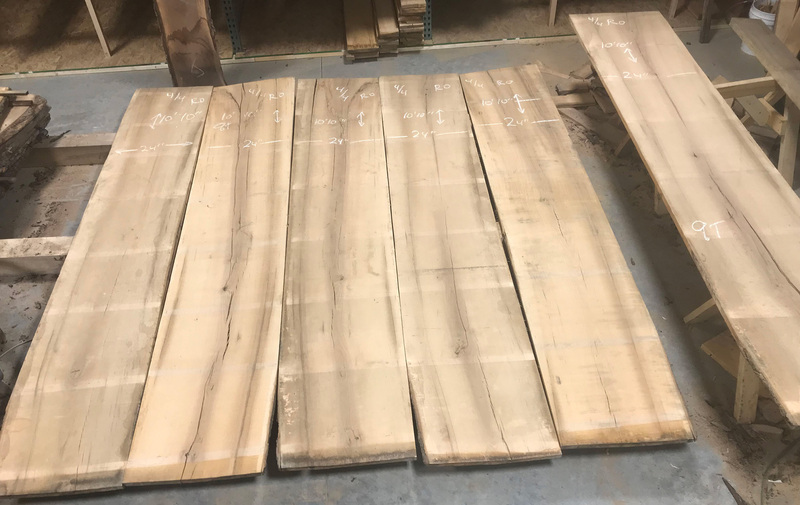 Seven 7/4 walnut slabs, 28" to 33" wide and 21" long. Five 7/4 walnut slabs, 32" wide and 18" long. 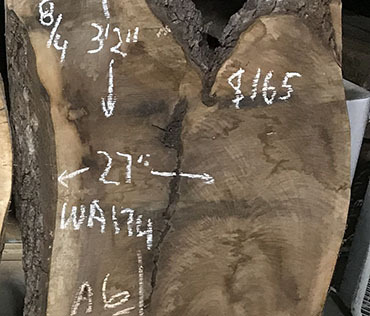 Four 7/4 walnut slabs, 26" to 29" wide and 20" to 22" long. Two 7/4 and one 8/4 walnut slabs, 18" to 19" wide and 21" long. 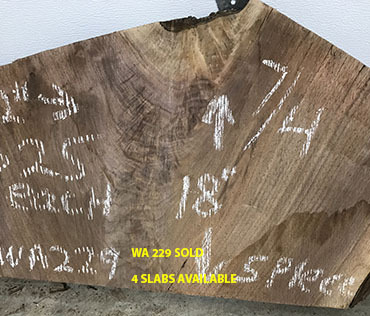 Four 7/4 walnut slabs, 16" wide and 18" to 22" long. Three 7/4 walnut slabs, 22" to 26" wide and 24" to 25" long. Three 8/4 and two 6/4 walnut slabs, 19" to 27" wide and 32" to 38" long. Six 8/4 walnut slabs, 31" to 33" wide and 37" long. 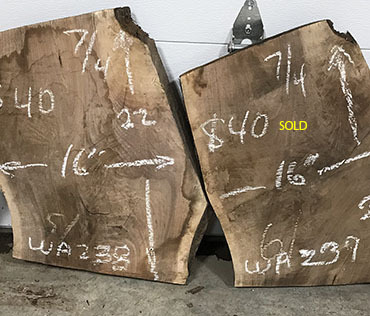 Two 6/4 and four 7/4 walnut slabs, 13" to 19" wide and 29" long. One 8/4 and four 7/4 walnut slabs, 13" to 19" wide and 28" long. Six 8/4 walnut slabs, 13" to 22" wide and 3'9" long. Six 8/4 walnut slabs, 14" to 21" wide and 3'7" long. Five 6/4 walnut slabs, 12" to 16" wide and 12'2" long. Two walnut 6/4 slabs and one walnut 5/4 slab, 13" to 17" wide and 12'2" long. 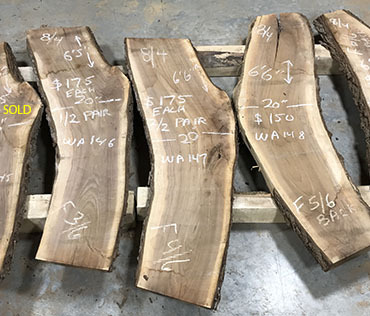 Seven 8/4 walnut slabs that can be bookmatched, 14" to 23" wide and 6'6" long. Three 8/4 walnut slabs, 14" to 20" wide and 10'6" long. 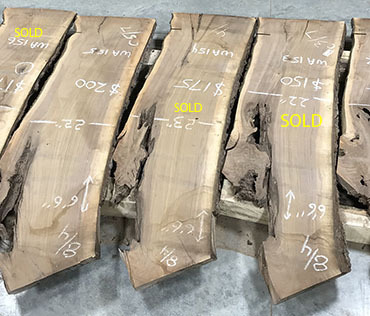 Assorted walnut slabs 5/4 and 7/4 thick, 8 1/2" to 12" wide, and 7'2" to 7'3" long. 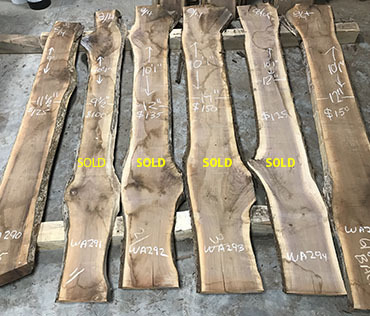 Five nice walnut slabs 4/4, 5/4 and 7/4 thick, 10 1/2" to 13" wide, and 8'11" long. Four walnut 4/4 slabs, 11 1/2" to 17" wide and 5' to 7' long. Three 6/4 walnut slabs, 6' long with beautiful crotch wood. 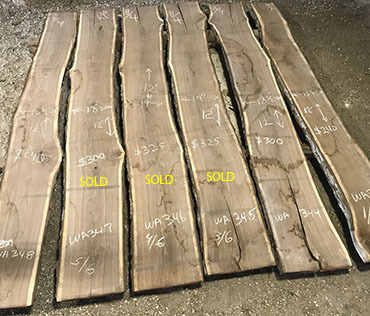 Five walnut 6/4 slabs and one 5/4 slab, 9" to 10" wide and 5'1" long. 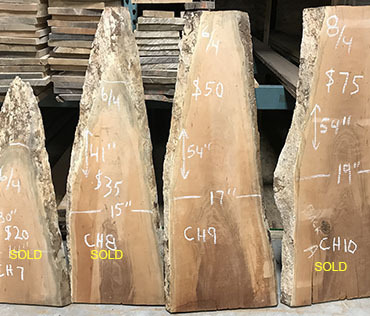 Six 6/4 walnut slabs, 6" to 10" wide, and 5' long. 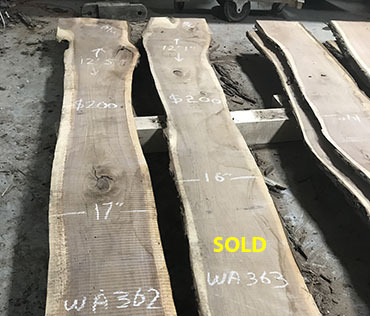 Four walnut slabs 6/4 and 8/4 thick, 5" to 10" wide, and 5'6" long. 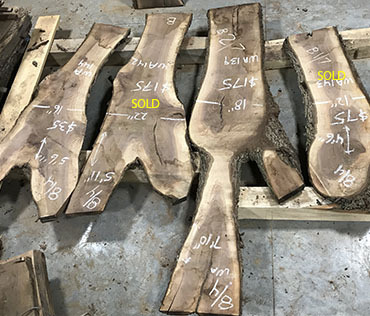 Five walnut slabs 6/4 and 8/4 thick, 8" to 12" wide, and 5'4" to 6'5" long. 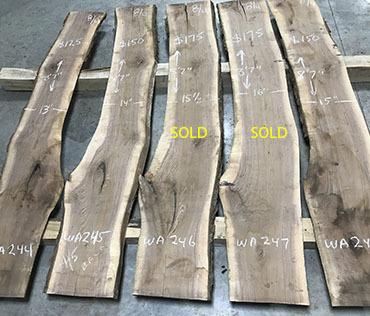 Three nice 4/4 walnut slabs, 11" to 13" wide, and 6'2" to 7'2" long. 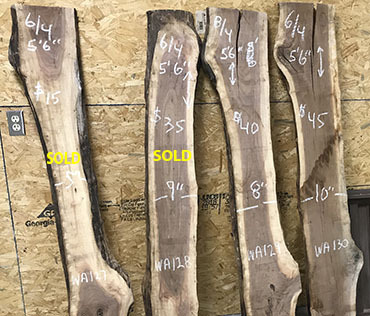 Four 6/4 walnut slabs, 7'10" long and 6" to 10" wide. 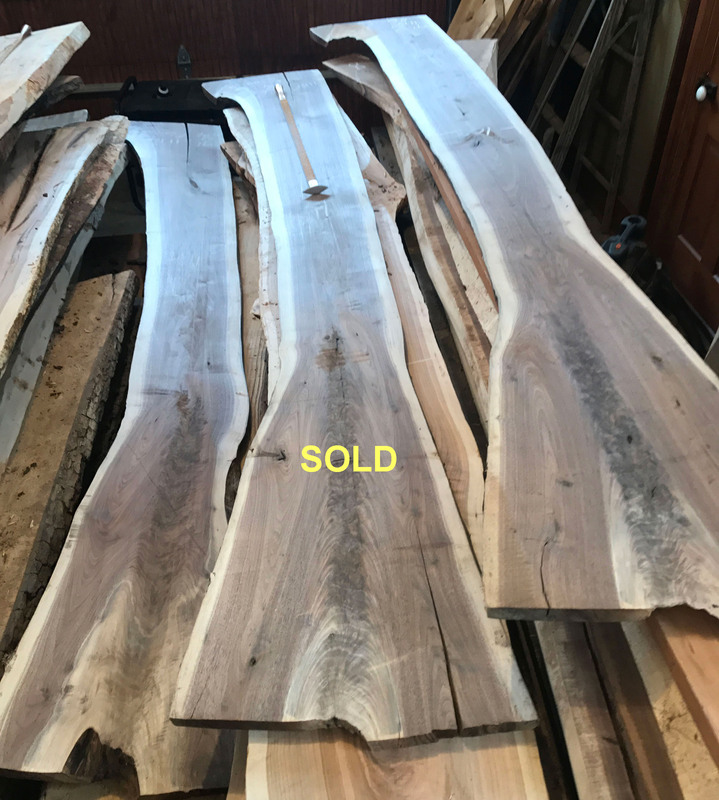 Five 7/4 walnut slabs, over 8' long and 10" to 15" wide. 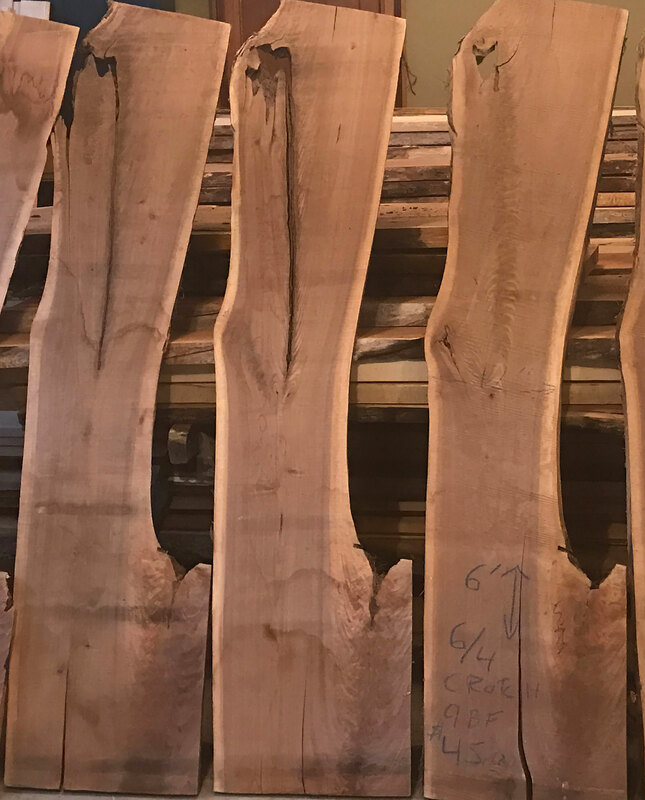 Five 7/4 and one 6/4 walnut slabs, over 7' long with beautiful crotch wood. Four 8/4 walnut slabs, 12" to 22" wide and 4'6" to 7'10" long. 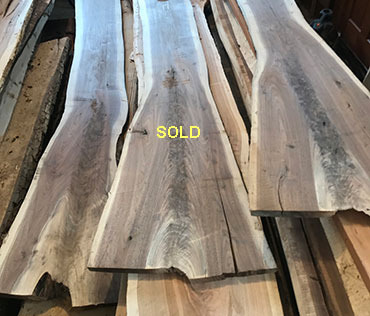 Assorted 8/4 walnut slab ends. 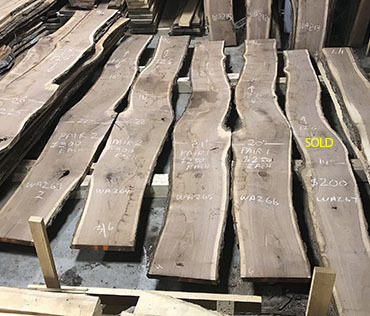 Assorted 16/4 walnut slabs, 9 1/2" to 13 1/2" wide and 86" to 9'11" long. 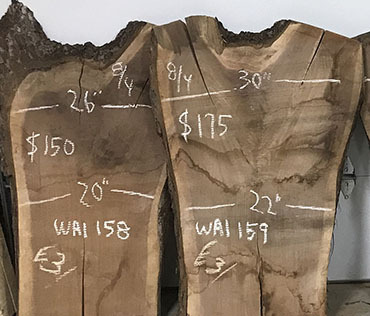 Five 8/4 walnut slabs, over 6' long and 16" to 20" wide with one matched pair. One 4/4 walnut slab, 10" wide and 10'2" long. Two 8/4 walnut slabs, 22" wide and 7'11" long. Thick wide walnut and cherry stock 8' to 11' long. 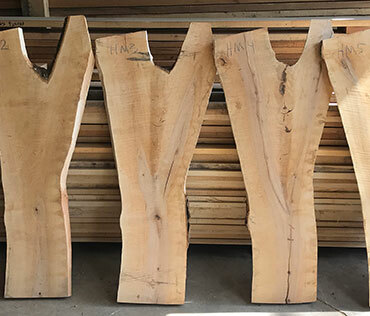 Three 8/4 cherry slabs 14" to 15" wide and 10'7" long. 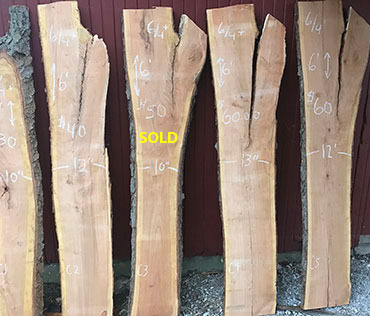 Five 8/4 and one 6/4 cherry slabs 15" to 18" wide and 10'3" long. Three 6/4 and one 8/4 cherry slabs 14" to 19" wide and 2'6" to 4'6" long. 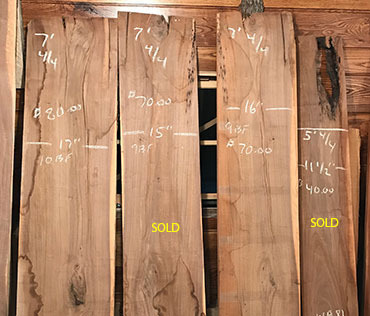 Six 8/4 cherry slabs 10" to 15" wide and 5'4" long. Five 8/4 cherry slabs 24" to 32" wide and 4'5" long. Two 8/4 cherry slabs 24" to 29" wide and 4'5" long. Six 8/4 cherry slabs 16" to 27" wide and 4'2" long. One 8/4 cherry slab 24" wide and 4'1" long. 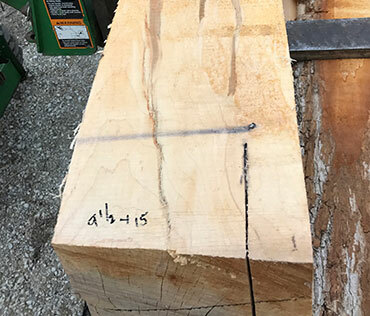 Four 6/4 cherry slabs 16" to 19" wide. 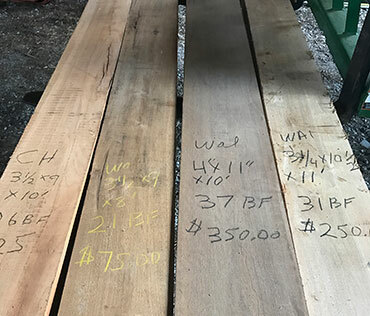 Five 6/4 cherry slabs 10" to 13" wide and 6' long. Three 7/4 cherry slabs 2'4" to 3'6" long. Four 6/4 cherry slabs with crotch 7'6" long. Four rustic 8/4 cherry slabs with live edges. Three rustic 8/4 cherry slabs with live edges. 8/4 cherry slab 15" wide and 11'3" long. 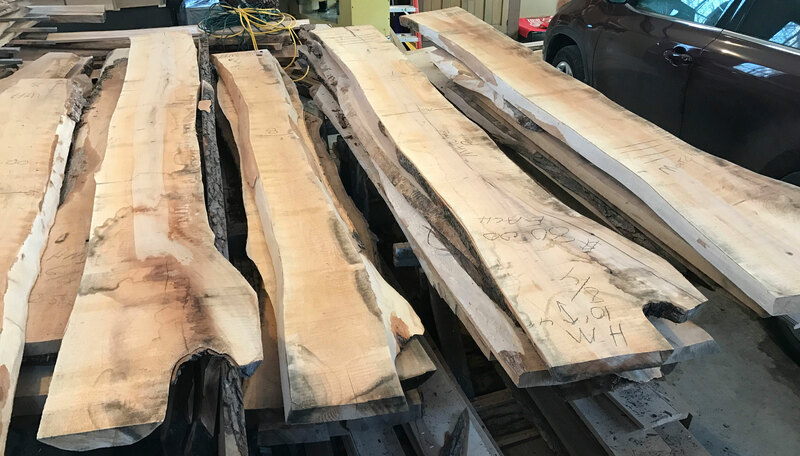 Six hard maple 5/4 slabs with crotch. Two 8/4 hard maple slabs, 7'6" long. Three 8/4 hard maple slabs 8' long, two with tap holes from maple syrup spigots. 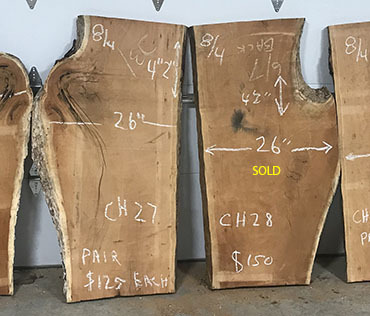 Four 8/4 hard maple slabs, some with crotch. 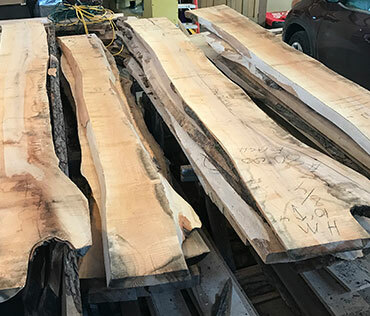 More assorted 8/4 hard maple slabs. Hard maple timber 15" wide and 9'6" long. 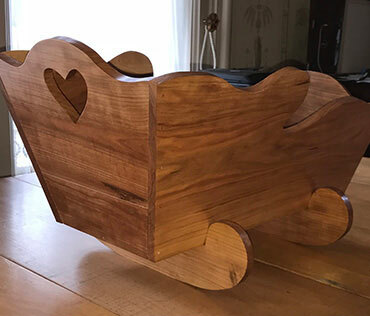 Could be used as a mantle or bench. Two 8/4 red oak slabs, 20" wide and 9'2" long. 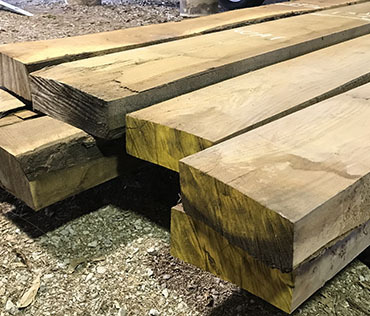 Four 8/4 red oak slabs, 9 1/2" to 18" wide and 12' to 12'2" long. 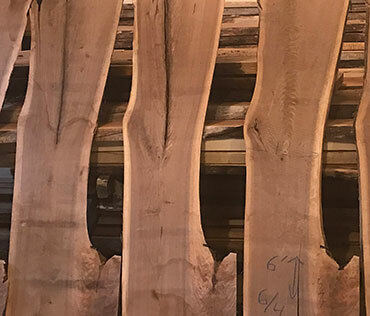 Two 8/4 red oak slabs, 12" to 15" wide and 8'4" to 10' long. 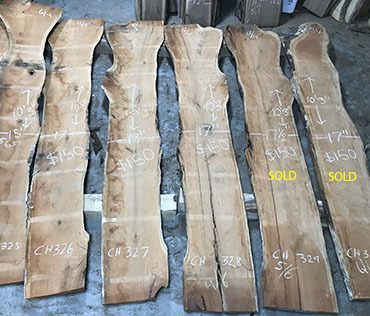 Four 8/4 red oak slabs, 7" to 17" wide and 5'10" long. 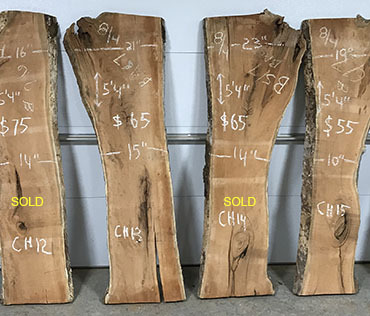 Four 8/4 red oak slabs, 14" to 17" wide and 5'10" long. 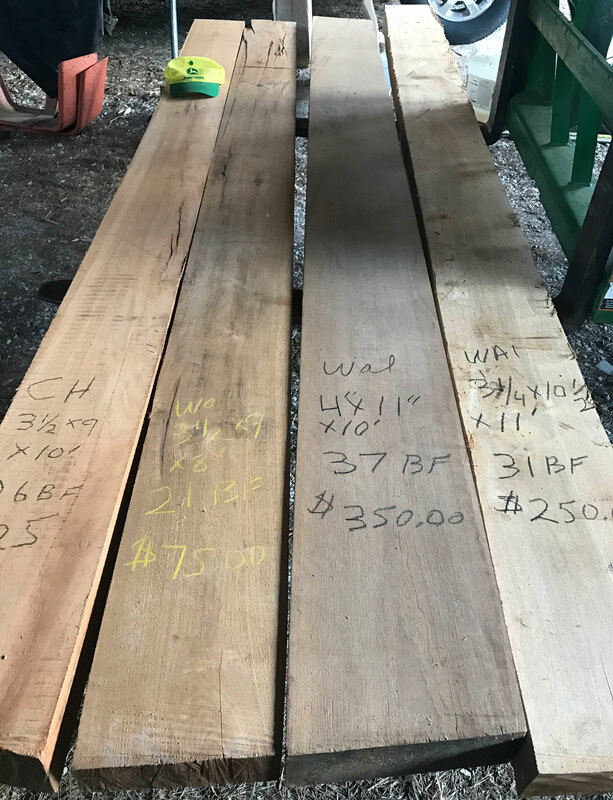 Five 8/4 red oak slabs, 15" to 18" wide and 10' long. 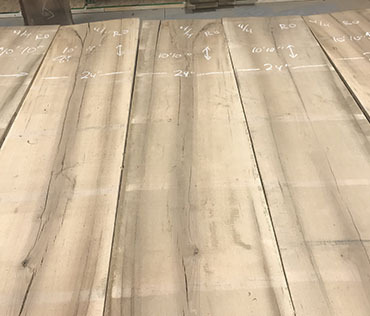 Six 4/4 red oak matched square-edged slabs, 24" wide and 10'10" long. 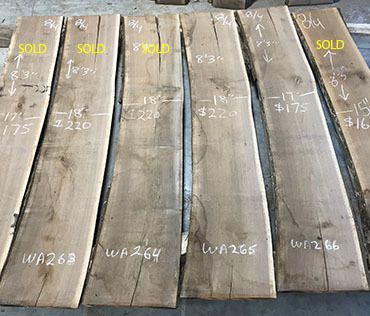 Six 8/4 white oak slabs, 13" to 17" wide and 5'11" to 7' long. 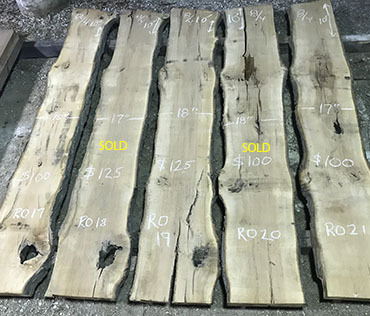 Eight 8/4 white oak slabs, including 2 matched pairs, some with ray fleck. 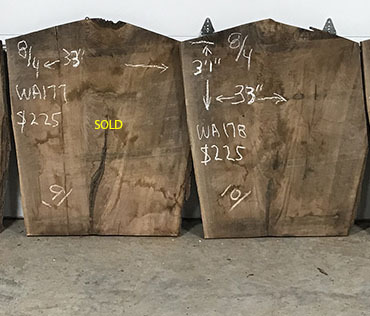 Three surfaced 5/4 walnut slabs with beautiful crotch wood - $75 each. 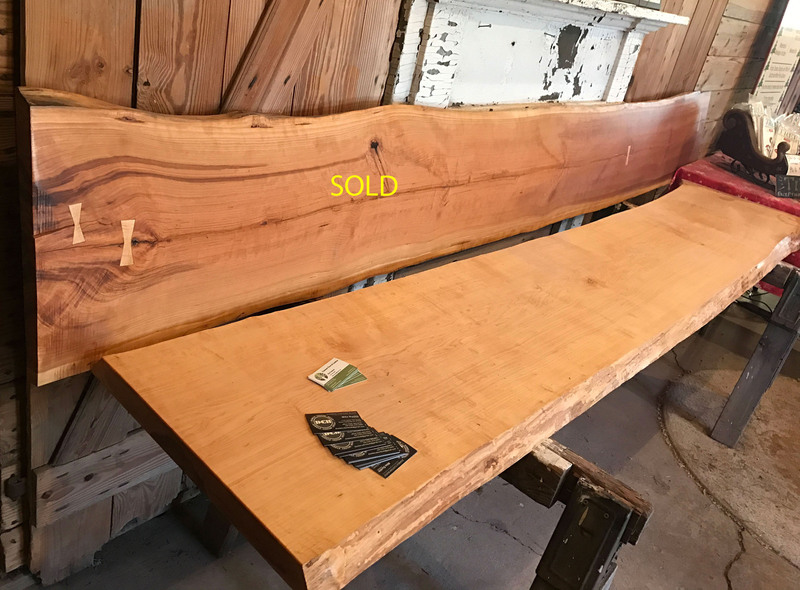 Finished 6/4 cherry slab, 15" wide and 64" long - $250. Three surfaced rustic 4/4 cherry slabs. 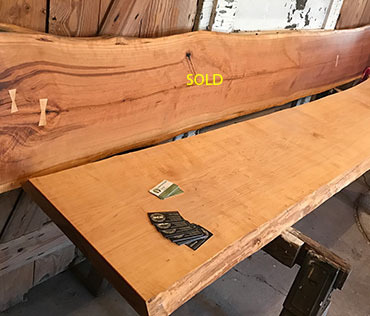 Finished 7/4 cherry slab with bowties 16" wide and 11' 1 1/2" long - $350. Finished 8/4 hard maple slab 19" wide and 9'10" long - $500. Finished 6/4 hard maple table top with figure, 30" wide and 6' long - $500. Two beautiful 6/4 figured hard maple S2S slabs. Beautiful figured hard maple S2S slab. 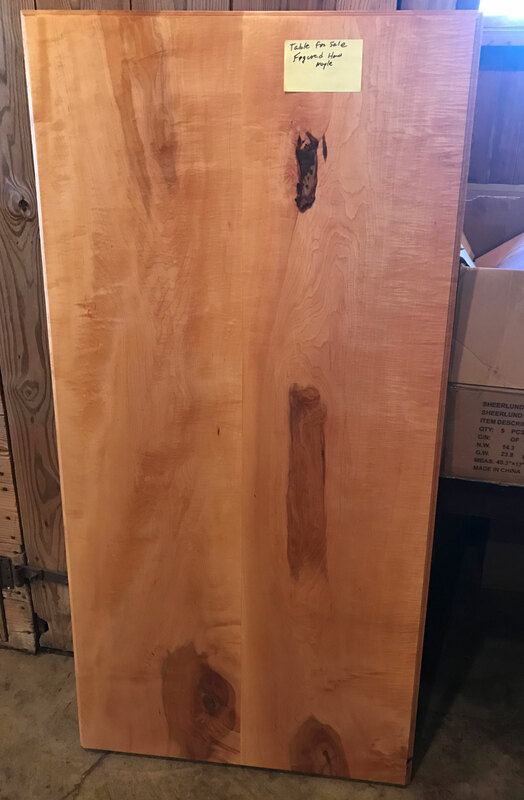 Surfaced 5/4 white oak slab 16" wide and 6'4" long - $70. 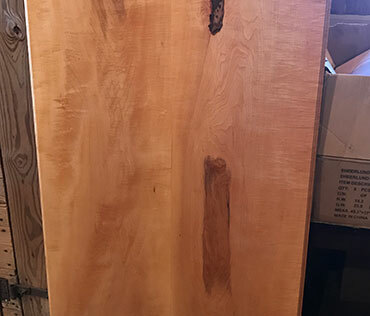 Surfaced 5/4 white oak slab 17" wide and 6'11" long - $90. 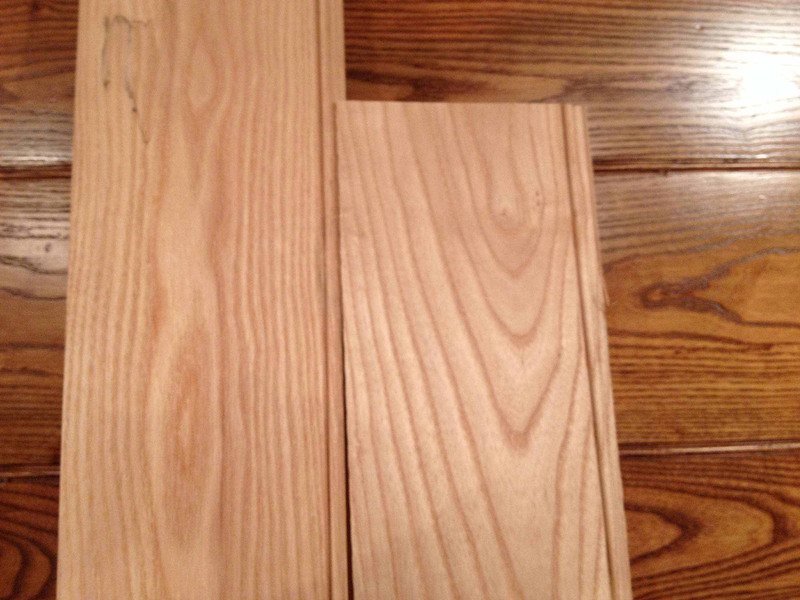 Well machined, tongue-and-groove, bead-one-edge solid walnut, cherry and ash hardwood wall paneling 8 to 12 feet long $2.25 to $3.00 square foot. 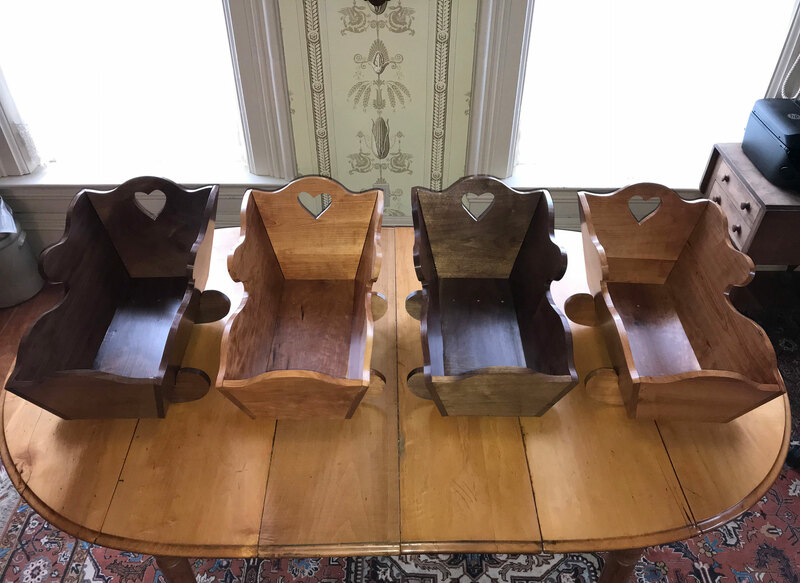 Walnut and cherry doll cradles - $150 each.